Dipping your toes into city cycling? Not ready to commit to buying a bike? Thankfully, Chicago is a place where you can experience the thrills of two-wheeled exploration without actually owning a bicycle. Find a Divvy station, rent a bright blue bike and take it out for a spin (a half-hour at a time). If you're looking for easy rides that, we've put together a list of Divvy-friendly bike routes that will take you across the 606 and to some of the best museums in Chicago. Don't forget to pack a helmet! 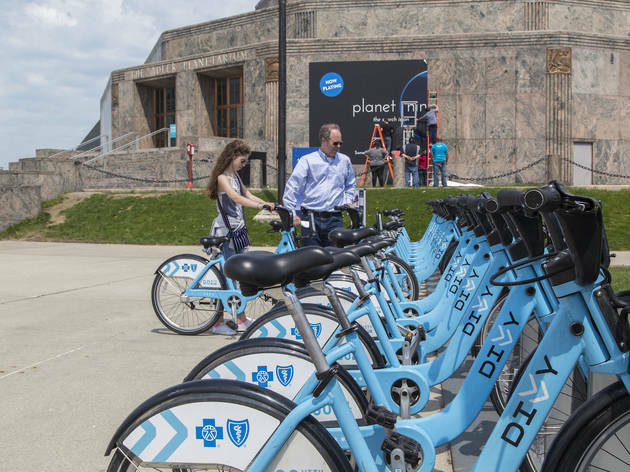 Hop on a bike at the Divvy station by the Marquette Building, and pedal north on Dearborn Street. If the Loop is congested, exchange bikes at the Clark and Lake Streets station, and continue north on Dearborn until you reach Washington Square Park. Ride through the park, and continue north on Clark Street. Take a slight left on North Avenue, passing by the Children’s Fountain (stop for a quick selfie) and continue north on Clark. Keep chugging along until you hit the Divvy station at Clark Street and Armitage Avenue, where you can dock your wheels and immediately begin ogling the animals in the Lincoln Park Zoo. PIT STOP: Read the words of Abraham Lincoln or hop on an antique El car at the Chicago History Museum, the city’s oldest cultural institution. 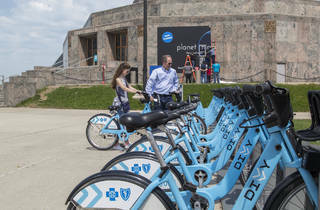 Grab a bike from the Divvy station in Jane Addams Memorial Park by Navy Pier, and ride south on the Lakefront Trail. If the path is clogged with pedestrians—and no, there are no bonus points for bumping the tourists—you can switch your bike at the station at Lake Shore Drive and Monroe Street. Continue south through Museum Campus until you hit Solidarity Drive, and head east. Dock your bike at the station by Adler Planetarium, and enjoy those singular skyline views from Northerly Island. PIT STOP: Refuel after your journey at Del Campos Tacos, a small food stand tucked away on Northerly Island’s 12th Street Beach. You’ve earned it. After collecting your ride from the Marshfield Avenue and Cortland Street Divvy station, cycle east on Cortland and hook a left on Hermitage Avenue. Continue to Wood Street and enter the 606 trail. As you ride west, look out for runners, families and fellow Divvy riders; vigilance (and some patience) is key to navigating the popular trail. When you reach the Julia de Burgos Park exit, dock your Divvy at the nearby station at Albany and Bloomingdale Avenues. PIT STOP: Make like the Flash and zip over to Challengers Comics + Conversation, where you’ll find books, toys and art for kids of all ages.